Through the years, the US Mint has included baseball and baseball icons on coins a number of times. There’s the Jackie Robinson commemorative silver dollar from 1997 with its portrait of Jackie Robinson sliding into home during the 1955 World Series. His team, the Brooklyn Dodgers, played the New York Yankees. 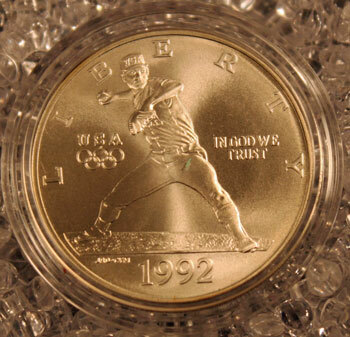 More recently, the Olympic coins of the Atlanta Centennial Games included a 1995 clad half dollar showing a player with bat poised for a pitch, a catcher and the home plate umpire. But, today, we want to talk about another Olympic coin showcasing a baseball player. In 1992, the first year of baseball as an Olympic medal sport, the US Mint produced a commemorative silver dollar. The obverse shows a right-handed pitcher with ball in hand and arm drawn back ready to pitch what he hopes will be a strike. The reverse shows the five Olympic rings, “USA” and a shield with thirteen stars and bars flanked by olive branches on either side. Frequently, we show proof versions of coins, but this time, we intentionally used the uncirculated version of the 1992 Olympic Baseball Commemorative Silver Dollar coin. Well, it’s different, and many people, including some coin dealers, do not know it’s different. The uncirculated version, but not the proof, has edge lettering. The letters include “XXV OLYMPIAD” for the summer Games in Barcelona in 1992. In addition, the lettering repeats and alternates direction with two versions up and two down. Between each group of letters is a wavy line, similar to a tilde (˜) but larger and in the middle of the edge. The next time you have the opportunity, take a look at the edge of the uncirculated 1992 Olympic Baseball Commemorative Silver Dollar coin. Even better, if you have access to both types, compare the edges of the uncirculated version and the proof version of the coin. Perhaps you can even impress your numismatic friends with a “Did you know” discussion about the different edges of the coin. Oh, by the way, in 2005, the International Olympic Committee dropped baseball as a medal sport after just five Olympic Games (1992, 1996, 2000, 2004 and 2008). Next year, baseball will not be a part of the 2012 Olympic games in London. 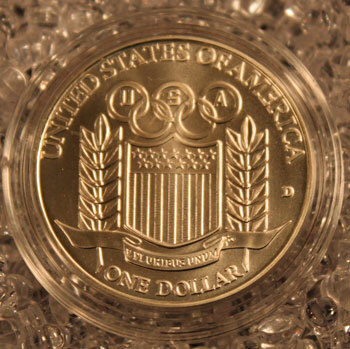 Perhaps people who enjoy both numismatics and sports collectibles will become more interested in the 1992 Olympic Baseball Commemorative Silver Dollar since the game will no longer be played in the Summer Olympiads. The coin’s value will be interesting to watch – especially since it is also 90% silver.